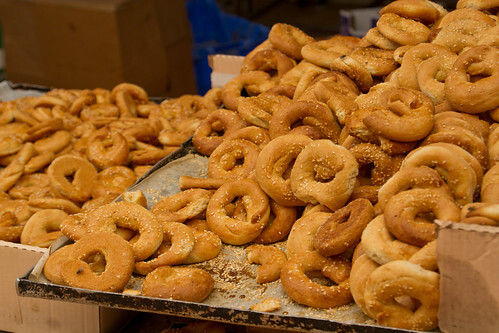 Which food lover doesn't like visiting a proper food market when travelling? I believe there's none. 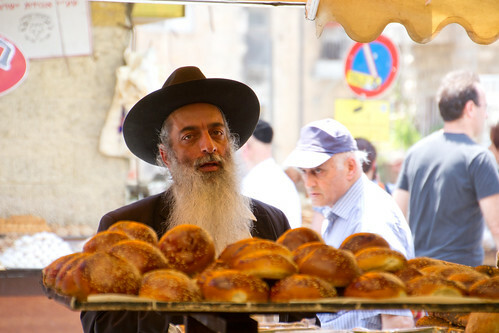 Here are some of my photos from the visit to the main market in Jerusalem exactly one week ago. 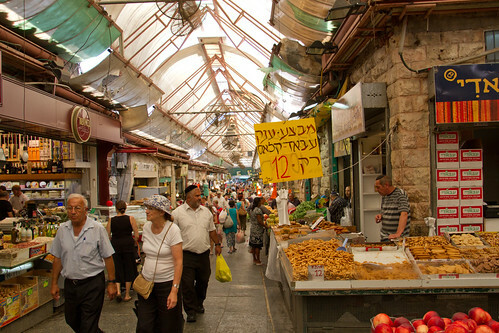 Also known as Machne Yehuda or simply the Shuk, Mahane-Yehuda market is one of the symbols of Jerusalem, the capital of Israel (and one of the non-religious kind). 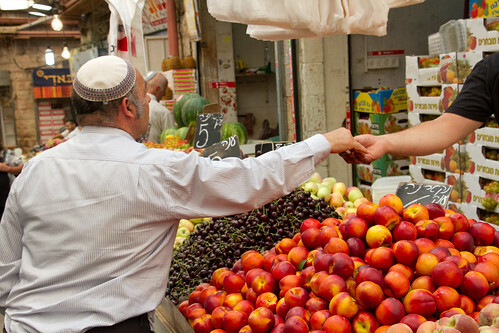 The market dates back to the Ottoman period (the first stalls began their trade at the end of the 19th century), and has seen several redesigns and developments during the last 100+ years. Today the market covers a rather large plot of land, and hosts stalls that offer everything from flowers to household goods to art to food. 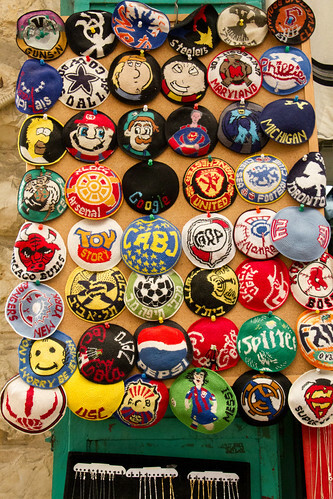 We, the foodbloggers, were obviously focusing on the numerous market streets specialising in food (that'd be Eitz HaChaim street, Machane Yehuda street, HaTapuach street, Eliyahu Banai street, HaShaked street). 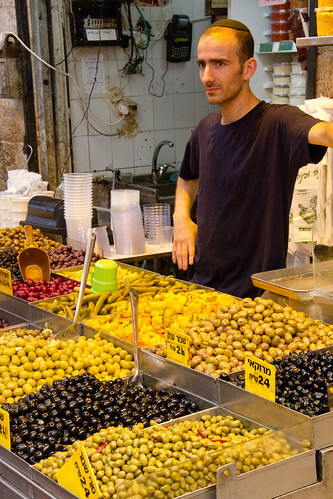 Our tour guide Zvi took as to several of his favourite food spots at the market. A great range of olives was sold at the market. 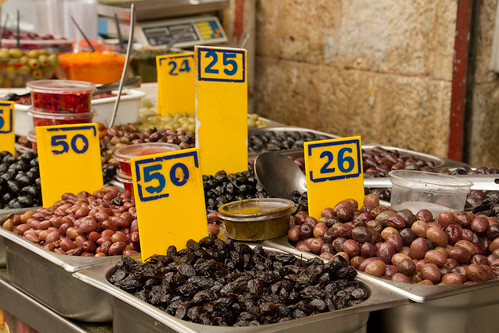 Many indigenous olive varieties are grown in Israel (f. ex. 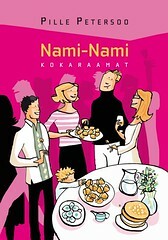 Souri, Barnea, Nabali (Balladi)), as well as internationally known Manzanilla, Kalamata, Picual, Novo, Leccino, Fishulin. 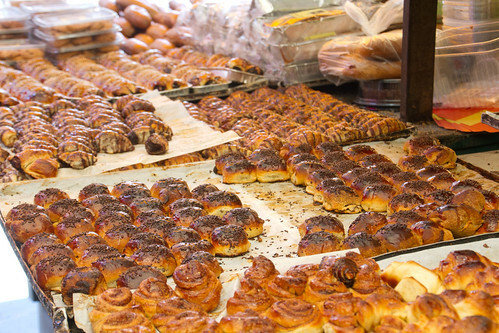 A great selection of fresh pastries. See the rugelach on the back (you'll find my two rugelach recipes when clicking on the link)? 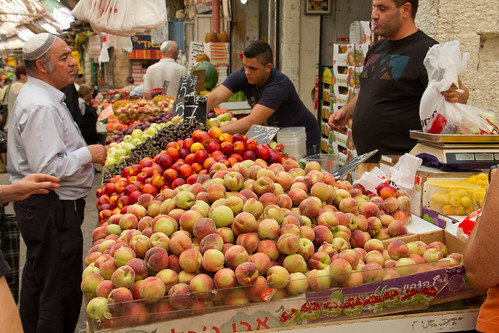 Israeli climate is perfect for growing figs. Again, several varieties are grown across the country, the one on the photo should be honey-sweet and pale pink Byadi. 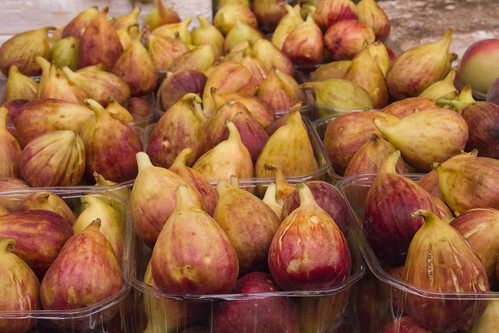 I had a chance to eat them later during the week again (and that's where I was told the variety of figs), and they're extremely soft and luscious and sweet. I was bemused by the cucumbers at the market. They look exactly like mini versions of our "regular" cucumbers - shiny, long, smooth and slim, just much smaller. Our "small" cucumbers that we eat a lot during the summer - 10-12 cm in length, crunchy and crisp as they are - are prickly and chunky, like you can see on the third photo in this old post of mine. The shopkeeper Tango Shavit (pictured left) treated us to three different types of Georgian cheese bread - hatchapuri (the traditional bread with cheese in the middle), acharuli (the boat-shaped open-top bread filled with cheese and topped with an uncooked egg that you mix yourself with into the very hot cheese filling) and magaruli (a simple hatchapuri that's topped with cheese and baked until crisp), as well as some Georgian pickles and the popular sweetmeat - walnuts dipped into thickened grape syrup and hanged to dry (churchkhela, pictured on the left). 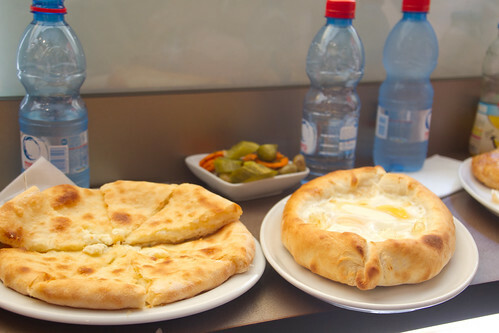 Other posts about my trip to Israel. If you're visiting the market and want some guidance, then this English-language website dedicated to the market might be a good place to start. Disclaimer: I spent six days in Israel in late June/early July as a guest of a non-profit social start-up Kinetis, more specifically their Vibe Israel programme. 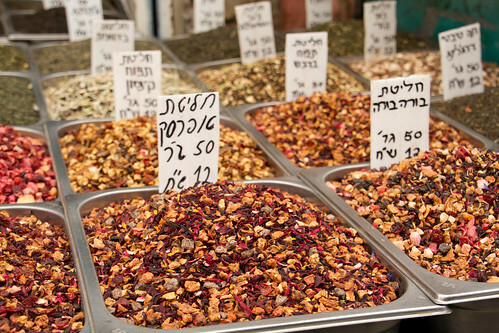 This particular trip hosted five international food bloggers and writers, introducing them to the multifaceted and pluralist Israeli culture and cuisine. 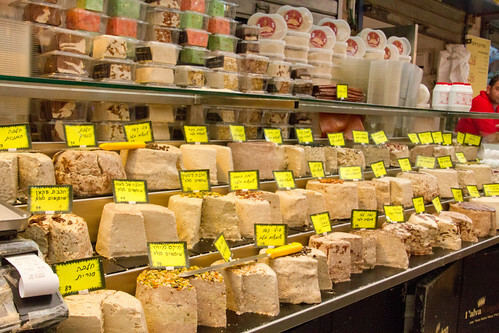 that halva stall looks amazing! 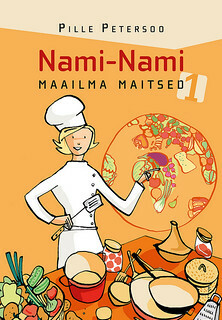 you seems to have had a ball and you really are making me want to go... what wonderful country and cuisine! 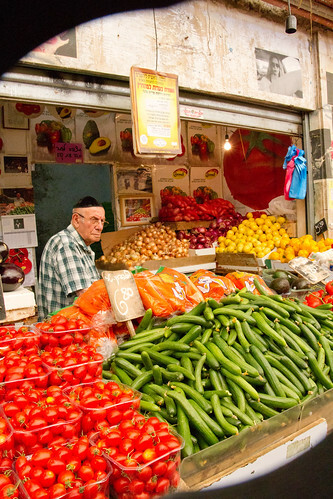 A lovely post and great pics from the Mahane Yehuda market:) I was following your and the 4 other foodbloggers tweets on a daily basis and you seemed to have a really delicious time here.Did you also see the Carmel-market in Tel Aviv? I visited this market many, many years ago. It would be wonderful to go back. Thanks for sharing your experience. This must have been an incredible experience. Thank you for sharing this post and photos. Fabulous post. I'm so pleased I found this. I was in Jerusalem in June, but spent my 5 days there at my son's bedside in hospital. 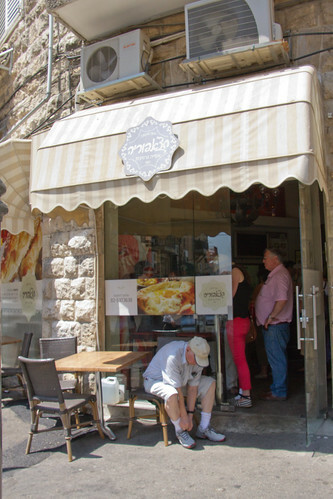 Thankfully, he is now fine, and I saw just enough of Jerusalem to know that I would love to go back and see more of it. This market was one place I really wanted to go to - but didn't manage. See magaruli paistab jube isuäratav! 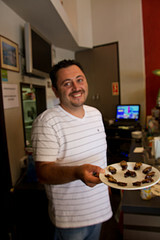 I am new around your blog :) and I love it..
Mmmm .. those figs look very tasty indeed. Olives, halva too. All my favorite things. so it is the same programme Kerstin Ms Marmite has been invite to? lucky you! What fun - I'd like some of those little pickles, please! Great post. I looove markets :). Johanna - the choice of halva was really impressive. I think i had only had vanilla-flavoured halva before..
Yaelian - nope, unfortunately no Carmel-market, but we did visit the newish (?) 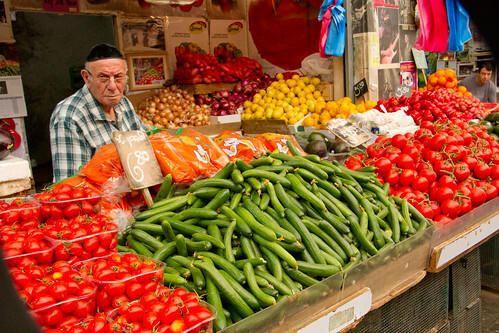 Tel Aviv Port/Harbour Market. Vernanda - nii kahju, et seda siginat-saginat kuidagi fotodel edasi anda ei õnnestu. Lydia - pleased to have had the chance to bring some good memories back! Vicki - it was fun and exciting indeed. Vandy - oh nooooo! I hate when you fall ill on your travels. So little time to start with, so many things to see. Hopefully you can go back again. Zappie - magaruli on hea tõesti. Just parasjagu krõbe, aga juust ei olnud üle küpsetatud. Nad teevad muide oma juustud ka kohapeal..
Emma - I've had some lovely figs in France, but this particular variety was really melt-in-you-mouth soft and tasted of honey. Wonderful, really wonderful. Katrina - yes, Ms Marmite, AND David Lebovitz - how could I have said no to the trip!? Cinnamon & Thyme - I love markets, too. A friend of mine lived in Slovenia for about 10 years and she really misses the Slovenian markets. These are pretty good, no? thanks so much for posting! the rugelach recipes look delicious!